Lake View Retreat is spacious, stylish and luxuriously furnished throughout. 4 bedrooms 3.5 bathrooms and multiple bed configurations - perfect for a group of friends travelling together or family holidays. It's also only a 5 minute drive or 20 minute walk downhill to the heart of Queenstown. Lake View Retreat is a four seasons Townhouse. Perfect for your winter holiday. Drying cupboard, ski and snowboard racks, roaring open wood fire, heat pumps, underfloor bathroom heating and wall heaters in bedrooms ensures all round comfort during your stay. The hot tub/spa pool has one of the best views on Queenstown Hill overlooking the lake and mountains. In summer the stunning barbecue and patio area, with its quality outdoor furniture as well as the bubbling hot tub with breathtaking views over the lake and mountains and town makes theidyllic setting for the perfect break. 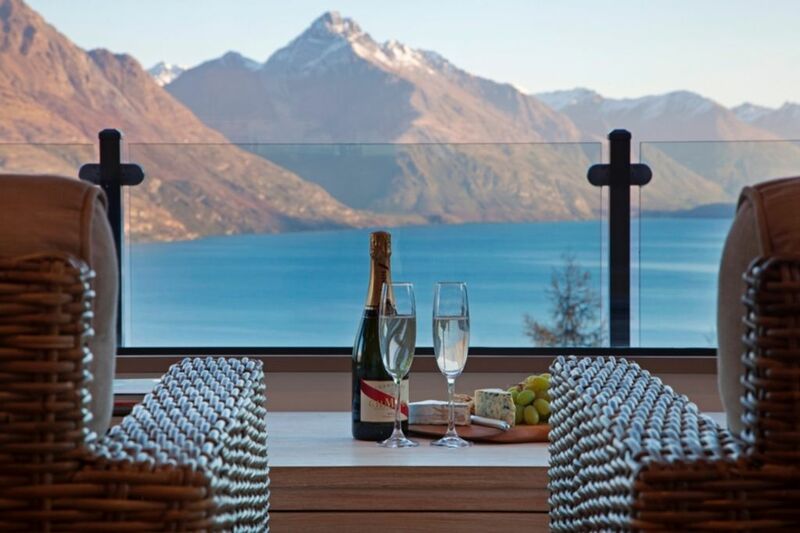 25 minutes drive to Queenstown's top two ski fields Coronet Peak and Remarkables Ski field, and five international golf courses within a 20 minute drive of Lake View Retreat. The 120kms cycling and walking Queenstown Trail is 5 minutes away. Lake View retreat is perfectly situated - 5 minutes from Queenstown CBD, but in quiet Street on Queenstown's dress circle Queenstown Hill. A $12 taxi ride into town makes for a great night out. As per resource consent outdoor areas are not to be used between 10pm and 7am (2200 and 0700). The house has spectacular views, we where 4 couples and the house was the perfect size. We were in Queenstown for our son's wedding and we couldn't have chosen a better place to stay during this special time. The home is stylish and comfortable, with everything needed for a family stay and some more. The view is truly breathtaking. Best holiday home ever, we didn't want to leave ! Beautiful spot, unbelievable views, beautifully furnished and excellently equipped. Beautiful spot, unbelievable views, beautifully furnished and excellently equipped. Our two family holiday went so well, thanks to Kaye and Lake Side Retreat. We loved it here. well recommended. You can't go past this place to stay. You won't be disappointed! Beautiful, very comfortable large home with the best views of snow-capped mountains, green hills, and twinkling night city lights. Quick access to city centre with endless choices for coffee, dining, shopping and activities. Loved it! The house in Queenstown was gorgeous. The house in Queenstown was gorgeous. Great views, great location, couldn't have asked for more. This Lake View Retreat was just that! A delightful treat. This Lake View Retreat was just that! A delightful treat... amazing views and furnishings. This home has such an elegant and calm vibe and certainly filled our holiday with many happy memories.